(CNN) - Sen. Rand Paul labeled New Jersey Gov. Chris Christie a "moderate" on Tuesday, hours after the governor described himself as a "conservative." "I think the Republican Party is a big party, and we need moderates like Chris Christie who can win in New Jersey," Paul said on CNN's The Situation Room with Wolf Blitzer. "What that means about the national party, I'm not sure there's an answer. But we do need moderates like Chris Christie in the party." 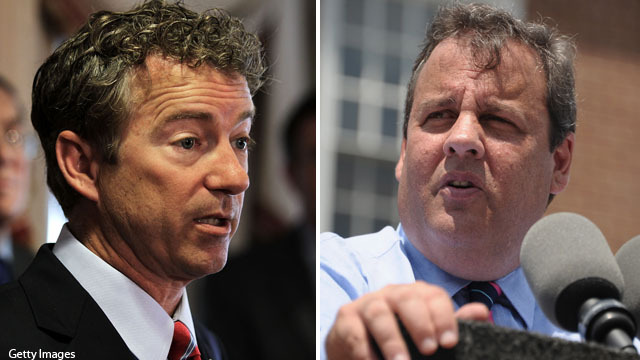 Christie and Paul, both considered potential 2016 presidential candidates, engaged in a back-and-forth earlier this year over ideology versus pragmatism in the Republican Party. Paul, of Kentucky, argued Tuesday he thinks the GOP is generally "more conservative" than Christie, suggesting the governor has a tough road ahead if he decides to seek the 2016 Republican presidential nomination. "I think it will be more difficult - states like Iowa are very conservative," Paul said. "South Carolina is very conservative. New Hampshire, I think, is conservative with a little bit of a libertarian bent." Christie was considered as a potential running mate by Mitt Romney's campaign last year, but he has since fallen out of favor with some in the conservative base for praising President Obama after Superstorm Sandy and sometimes taking more establishment GOP positions on issues involving national security. Asked earlier Tuesday if he considers himself more of a moderate or a conservative, Christie told CNN's Jake Tapper, "I'm a conservative." "I've governed as a conservative in this state, and I think that's led to some people disagreeing with me in our state, because it's generally a left-of-center, blue state," he said. "The difference has been is I haven't tried to hide it, or mask it as something different," Christie added. For his part, Paul argued Tuesday the GOP needs to be a "broader party in many ways," saying "I welcome (Christie) to the party and think he's an important part of it." He's a Democrat and we all know it. "I think the Republican Party is a big party, and we need moderates like Chris Christie who can win in New Jersey,"
Did Lil Randy, actually have an original thought, or do we need to see footnotes? That's just fine. Many of us have labeled Paul a dimwit. nothing new here, CNN...everybody knows Christy is middle of the road, but a little right....moderate is the best description of Christy......If the extreme right wing of the party suddenly decides to distance themselves from Christy, they will making a huge mistake..... right now, they don't have anybody.....He will be able to defeat 'ol Hill, if their party start coalescing around him. Rand worried of Christie for 2016 or he is just jelous cause Christie a re-elected governor showing major support by his state? "I welcome (Christie) to the party and think he's an important part of it." "We do need moderates like Chris Christie in the party". How swell of you. Your pandering shows how shallow and desperate you are little man. Go home. Iowa cannot save your sorry hide. And, New Jersey can't save Christie. Have fun. Obviously he read that Christie is a moderate and repeated it. Guffaw. I'm conservative! No, I'm conservative! I'm extreme! No, I'm more extreme! I want so much freedom for everyone, I'll legislate who you can marry and what you can do with your body! No, I'm the freedom-lover who wants to institute Biblical law so we can all be free together! It's gonna be fun in the coming months watching these two chase each other down the rabbit hole. This is how out of touch Little Rand is... Christie is NO MODERATE and he is MY Governor! Does any person who does not hold bagger views automatically get labelled as a moderate? What does Wikipedia say? Christie is not quite moderate. Rand Paul is out there pandering to the fringe...again!!! Moderate is not a dirty word. It's what has helped build this country and our nation. Something has to unite us and by pure definition it's not a fringe quality. Unless you consider everyone being tired of the nonsense a fringe candidate brings to the table. Get him Curley top!! He's a RINO!! LOL. I think it was very nice of Rand Paul to welcome Gov, Christy to the Republican Party. This is a perfect example of how inclusive Rand Paul can be. I'm sorry to say ,Rand Paul looks and acts more and more like Justin Beaver every day ! Rand Paul don't get it yet, Siding with Tea Party during partial shutdown of the government while ignoring the country needs will cost the Republican Party in a big way in the next presidential election. Moderate he may be, but he can still stomp the crap out of AquaBuddah and Crud!!!!!!! He is a Democrat inside. –Not even moderate.